It's been a while since I've shown you a demonstration (with the French elections coming up in April/May people don't think it's worth demonstrating for the government may change!). 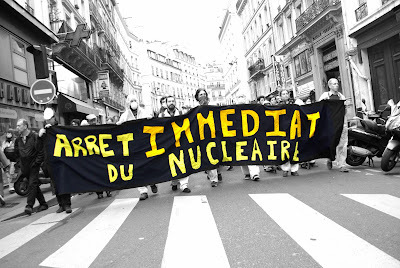 This one passed right in my street, so I did not have to go too far to take the photo ;-) It took place a couple of days ago on the anniversary of Fukushima, to protest against nuclear power (in France about 80% of the electricity is of nuclear origins). This is a great photo, Eric! I'd ask how you get so lucky, but I know it's skill, not luck. Fascinating topic. If 80% of the power is stopped immediately, what then? It is a conundrum all over the world, and the debate is heating up here in the U.S. as well. Fukishima is the latest reminder of our addiction to electricity. There are no easy answers. Cette photo est parfaite. I agree with the protesters but I won't live without electricity either. Long live double standards. I think renewable energy HAS to be the future. Great treatment, leaving the banner in colour, very effective. Thousands of people die in mining accidents producing coal for polluting power stations. Nuclear is far safer. It is a lack of scientific understanding and a primitive fear of the unseen (radiation) that motivates a lot of this protest. France is sensible. I didn't know so much power in France is nuclear! China has 27 nuclear plants nder construction. There are 442 nuclear power stations in the world and 16 countries currently have 65 plants under construction. @Jeff "If 80% of the power is stopped immediately, what then? " Well, good question. France stops! Everything - almost works on electricity, even my gas boiler needs a spark and an electricity powered engine to work. @Monnica "But that was all before the earthquake in Japan..."
@Bettina " I think renewable energy HAS to be the future." Well let's hope so, but so far it's unable to replace gas, oil or nuclear power plants. Spain, has a lot of wind turbines, they even claimed that at some point they produced 50% of their needs thanks to these turbines, but that was for a specific moment only. On average they produce 20% of their electricity with wind. @Stewart "Nuclear is far safer. It is a lack of scientific understanding and a primitive fear of the unseen (radiation) that motivates a lot of this protest. France is sensible." Well I think it's a different kind of risks; it's safer as long as you have no accident. If you do, you can quickly catch up the number of casualties that coal mines can cause. So far, you're right, it has proved pretty safe. (One thing though, we still haven't found a suitable solution for wastes). @Adi "I hope you will decrease it before I move there" Well, it is very unlikely, not only do we have huge needs, buut on top of that France is one of the leading nuclear ppower plants manufacturer... I'm not an activist, I just pay attention to my environment and I try to free myself from any ideology as much as I can. @extradiagetic "China has 27 nuclear plants nder construction. There are 442 nuclear power stations in the world and 16 countries currently have 65 plants under construction." Yes, whether good or bad, I don't think the world can develop without nuclear energy. There might be an alternative with hydrogene, but it's a little early. I try to imagine you out in front of this demonstration with your camera and I smile at your passion for getting the right shot. This is a great photo of an important demonstration. Here in the US, we've about 20% of our electricity produced by nuclear means. And, you're right, the problem is what to do with the waste? One option is the "deep" burial procedures, but even with this, experts suggest that the waste will often outlive the containers which could result in contamination of water supplies et al. Plus, it takes hundreds of thousands of years for the "waste" to become biologically "safe." Yeah, that causes one to think that maybe "solar" and "wind" aren't such a bad way to go. I know that "coal" is still being mined for plants in the States and the coal-tar waste byproduct has led to a lot of protests here, esp in Tennessee where water was contaminated and resulted in deaths and illnesses. This is a difficult issue to solve but one that needs more of our attention. This would make a great news photo. Lots of questions but no easy answers. Sometimes it can be easy to see everything in black and white (with perhaps a spot of yellow thrown in) when you won't be the ones with the responsibility for making difficult and complex decisions. Seems like the argument is already lost as far as France is concerned. I was going to say what Coltrane said (hi, Coltrane!) about the way you took this shot. Impressive! But with 80% of the electricity being generated by nuclear power, good luck turning that around.